Can you move faster than the speed of light? 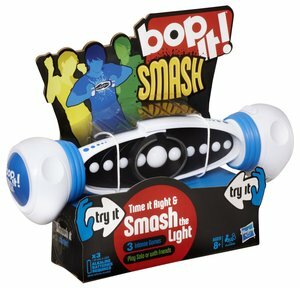 You’ll have to put your reflexes to the test as you attempt to control, trap and play with light in the all-new BopIt! Smash. Similar to other Bop It! favorites, Bop It! Smash is a fast action, reaction skill game, but with a new challenge. Players must move fast to be able to trap a rapidly-moving light in the center of the game unit by quickly smashing the ends of the game together. The closer the light is to the center, the more points you score! Robyn is loving this game - it's great because it is small enough to travel with and it's a game that lets you get active and helps you with rhythm and reaction! It's great to play in a group - trying to get more points than your opponents, but it's also versatile enough to be played alone, "for practice" Actually there are several different different ways and it's been great fun for the family to compete and try to get better and better! This has been a great toy for travelling with kids because it's compact and simple to use - there are no pieces to lose and it's great because you can play at the rest stops or wherever you are! Disclaimer: I received this product at no cost to me for the purpose of this review.